This section of the tutorial deals with user-defined models. You will continue with the schematic that you saved in 2.4 Edit Parameter-Extracted Models and then change the diode to a user-defined model. A user-defined diode model can be used to model an ideal synchronous rectifier, with the minimum of circuit components. 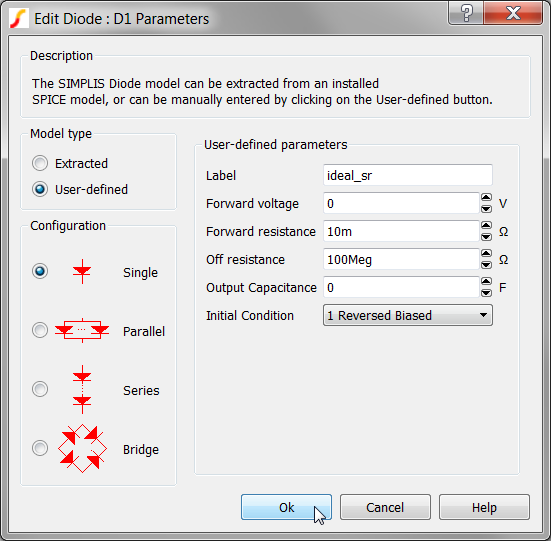 Diode models are implemented with PWL resistors in SIMPLIS. How to model a synchronous rectifier with a user-defined diode. 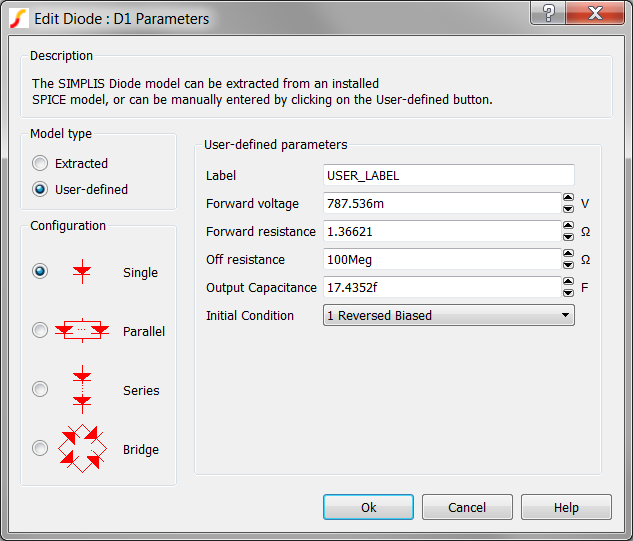 SIMPLIS Diode models are PWL resistors with a high off-resistance and a low on-resistance. The parameter-extracted models use a three segment model, where the third segment represents an intermediate resistance between the high off-resistance segment and the low on-resistance segment. The forward voltage of the diode is 0V. When the diode current is positive, the diode has a forward resistance equal to the on-resistance of the synchronous rectifier MOSFET. When the diode current is negative, the diode turns off and the resistance is high, representing the off-resistance of the synchronous rectifier MOSFET. Because the diode turns on and off in response to the circuit voltages and currents, the timing for the synchronous rectifier is ideal, that is, no dead time or drive signal is required. You will now change the diode to use the user-defined model and enter the parameters to make it behave like an ideal synchronous rectifier MOSFET. Double click the D1 symbol. 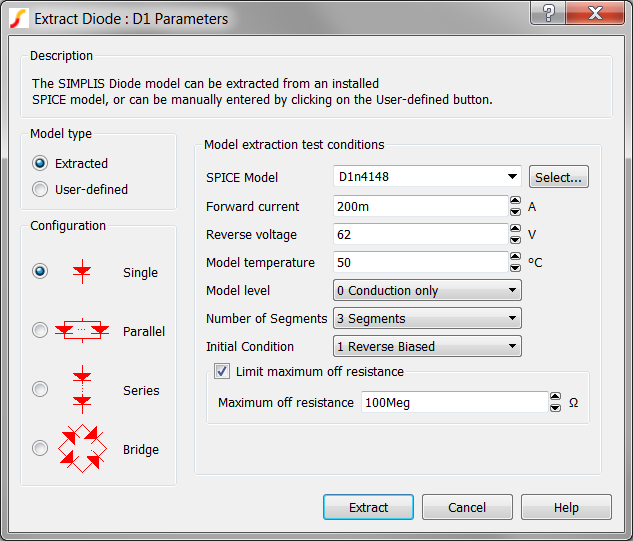 Result: The Extract Diode : D1 Parameters dialog opens. Click the User-defined radio button on the upper left side of the dialog. Result: The parameters on the right side of the dialog change to User-defined parameters. Note: The User-defined parameters are set to the values calculated in the last parameter extraction. Result: The diode now represents an ideal synchronous rectifier with a 10mΩ on-resistance and 100MegΩ off-resistance. The forward voltage drop is 0V. A schematic saved at this state can be downloaded here: 2_SIMPLIS_tutorial_buck_converter.sxsch.